Raku is an ancient firing process American potters have learned from the Japanese. The pottery is removed, red hot from the kiln and placed in combustible material, which bursts into flames. The flames are smothered causing a smokey reduction process that leaves the unglazed portions of the clay black. 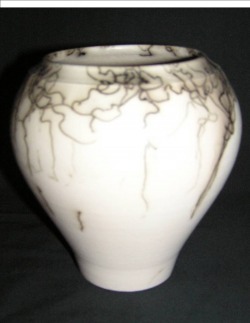 Raku is a low temperature firing process. Pieces are not to be used for food or drink, but are decorative only. Each hand made pot is unique; sizes are estimated only, and prices are subject to change.